My hometown, Ipoh, is pretty well-known as a super hot city. Although it rains almost everyday recently, but when it’s not – really damn hot! On one random night, when I was out in town searching for food – I noticed this. I guess it was some technical fault but hey, looks like Hotel Excelsior is claiming that it’s “HOT” too! HOT !!! We have good hot food too in Ipoh !!! me first ? wow ! what an honour. I believe the picture is true . I had a conference in their meeting hall upstairs 2 weeks ago and realised it. Good job ! Ui you’re like Kenny Sia in every aspect, lol!! even short posts also looks like him! hot???? lol supposed hotel uh? the Hotel is feeling the heat. haha. nice catch! i wonder what Excelsior means. I studied in UTP..both my grandparents in Simpang Pulai n Batu Gajah..
Old hotel…must be bad management, everything conking out already….and it’s not even cheap!!! VERY expensive! ahhhh… like that also u could observe.. they are helping to lower down global warming la.. minus 2 letters can save electricity a bit..
hhahaha…never saw this happen during my 7 years stay in Ipoh..kehkehkeh.. This ‘3rd rock from the sun’ gettin’ hot n hotter everyday.. The Funniest Signboard In Malacca.. hahaha poor Malim..
Lol, to me Ipoh is more like a desert. Daytime very hot but night time very cold! You might leverage more from your blog if you add Google Adsense contextual ads. it doesnt look like a hotel at all .___. 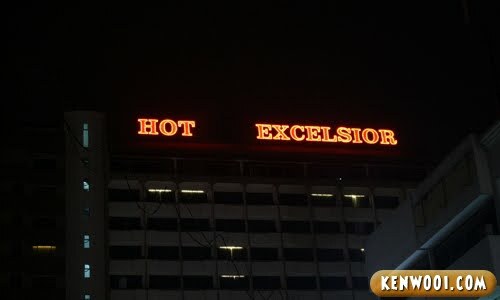 thought excelsior is a 5 star hotel…this kind of thing can happened!! Btw, yeah lor..Ipoh is real hot. Though i born in Ipoh, I still cannot tahan the weather in Ipoh! Actually KL is just as hot if not hotter! Can’t stand the heat!!! WOU!!!! haha, the “EL” is out of light!!! i wondering what EXCELSIOR means..
taiping get rain more than ipoh..
Yeah it is hot. And there’s the rain. On alternate days. But still I feel myself sweating every night before bedtime. Geez … whatever has happened to Ipoh? My kampung is in Ipoh too. Btw, this hotel is very bad.